Meet Sergeant First Class Carlos A.
Carlos joined the Marines in June of 1990 and was deployed three times – twice to Iraq and once to Afghanistan. Nearly five years after being discharged, Carlos’s patriotic spirit led him to join the National Guard in 2003. But pursuing a military career and courageously serving our country is only half of Carlos’s story. Between deployments, Carlos also serves customers as an Enterprise Car Sales Certification Coordinator in Fort Myers, Florida. Balancing his military commitments, including a promotion to Sergeant First Class, with his Enterprise responsibilities required flexibility and support from Carlos’s team and supervisor. 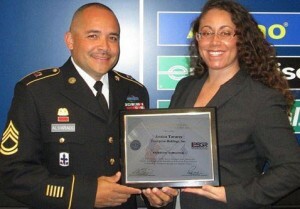 It was the flexibility, growth and career opportunities that led Carlos to nominate Jessica for the Patriot Award. The award is presented by the Employer Support of the Guard and Reserve, a Department of the Defense office, to supervisors who support Citizen Warriors through a variety of measures including flexible schedules and granting leaves of absence if needed. Carlos was thrilled when he received the news that Jessica had won and presented the award along with his team in December. Carlos recently embarked on his fourth deployment where he is serving as the lead translator for training Central and South American forces as they work to strengthen their borders. -Employer Support of the Guard and Reserve (ESGR) Statement of Support Program: Enterprise was recognized with the Secretary of Defense Employer Support Freedom Award – the highest honor given by the U.S. government to employers that support their employees’ service in the National Guard and Reserve. -Freedom Award Nominee by the ESGR: Enterprise was one of only two Missouri companies to receive the first Extraordinary Employer Support Award from the ESGR for sustained support of employees who serve in the National Guard and Reserve.